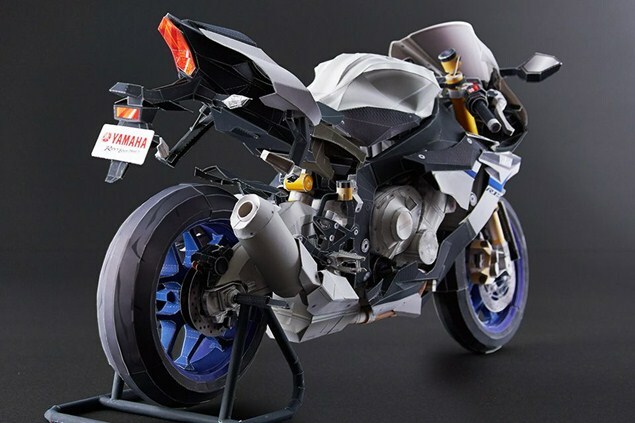 NO, we’re not quite in the era of being able to download and 3d-print a whole motorcycle but Yamaha has added to its long-running series of ‘papercraft’ models with a ridiculously complex and detailed version of the 2015 R1M and it’s available for anyone to have a go at making with nothing more than a normal printer and endless time and patience. Yamaha’s papercraft bikes have been around since the late 90s (along with an slightly inexplicable series of 3d animals) but for the latest generation Yamaha has stepped it up a notch with its ‘ultra-realistic’ range. The R1M is the third in the ultra-realistic series, joining the V-Max and MT-01, and is probably the most intricate yet. You’ll need no fewer than 54 sheets of A4 (and a small lake’s worth of colour printing ink) to print off the components – something approaching 800 of them, each needing careful cutting-out, folding and sticking – which should be enough to tell you that this isn’t a project to do on Christmas afternoon with the help of the kids and a large sherry. In fact, if you can finish it before next Christmas and end up with something that resembles a motorcycle rather than a screwed-up ball of paper and glue, we’ll be impressed. Seriously, if you manage to make one, we’d be interested in seeing the results.